The percentage of an industry or market's total sales that is earned by a particular company over a specified time period. Market share is calculated by taking the company's sales over the period and dividing it by the total sales of the industry over the same period. This metric is used to give a general idea of the size of a company to its market and its competitors. Knowing the position an individual company holds in the industry in which it functions or how much of the consumer dollar "pie" a brand has hold of, offers a company a decided competitive advantage when determining future ventures, making decisions about strategic directions and when jockeying for position among its competitors. The following resources provide insight into the best means by which to determine market share. This book, a paper resource, is immensely valuable in determining a company's market share as well as individual product or brand market shares. "An annual compilation of reported market share data on companies, products, and services. Presents market share data on over four thousand companies, and 2,500 products, facilities, and brands. Several entries are usually available under each industry. At this time an electronic version is not available." "Collection of market shares from the top 50 subjects covered in 22 editions of Market share reporter, with industry overviews, timelines, and more. Market Share Reporter: Trends Over Time covers 50 key industries (and the companies and products therein) throughout the world (including but not limited to the US, Canada, Mexico, Europe and Asia) that have been culled from the past editions of Gale's Market Share Reporter series. Each entry will include (1) an introductory overview essay about the industry; (2) a thorough timeline of events important to that industry over the last 30 to 50 years; and (3) a selection of between 15 and 30 of the most representative market shares for that industry that have appeared in Market Share Reporter, one of Gale's key reference series, since its first inception." 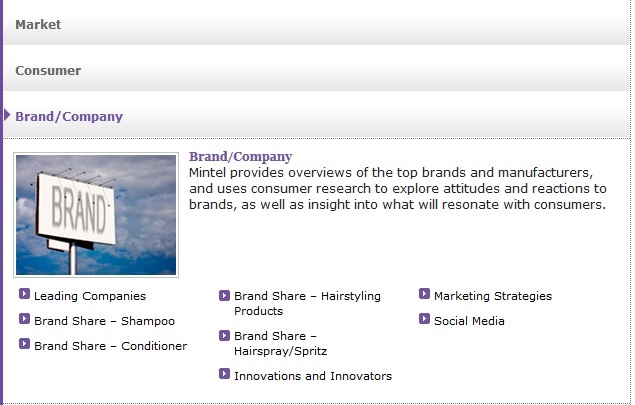 Offers research reports covering European, UK-specific, and US consumer markets. The reports analyse market drivers, sizes and trends, market segmentation, along with consumer attitudes and purchasing habits. Detailed market size data (for 330 consumer products in 49 countries, 1992- ), Country marketing parameters (1000 types of data for 209 countries, 1977- ), Marketing forecast data (330 products, demographics, to 2010), Brand and company information (100,000 brands from 12,000 companies in 1000 product sectors), Business information sources (over 29,000), Marketing profiles (6000 profiles for UK, USA, France, and Germany based on 156 consumer and industrial product sectors), and Full text market analysis (100 Euromonitor market research reports, including Strategy 2000 reports, International market intelligence reports, Market direction reports, and Emerging market reports). Each report consists of 30 to 40 pages of key statistics and analysis on market characteristics, operating conditions, current and forecast performance, major industry participants and more. Investors look at market share increases and decreases carefully because they can be a sign of the relative competitiveness of the company's products or services. As the total market for a product or service grows, a company that is maintaining its market share is growing revenues at the same rate as the total market. A company that is growing its market share will be growing its revenues faster than its competitors. Market share increases can allow a company to achieve greater scale in its operations and improve profitability. Companies are always looking to expand their share of the market, in addition to trying to grow the size of the total market by appealing to larger demographics, lowering prices, or through advertising. 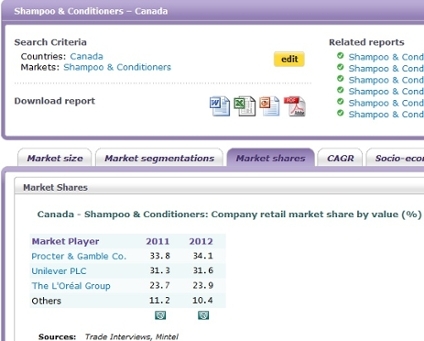 This calculation is sometimes done over specific countries such as Canada market share or US market share. Investors can obtain market share data from various independent sources (such as trade groups and regulatory bodies), and often from the company itself, although some industries are harder to measure with accuracy than others.